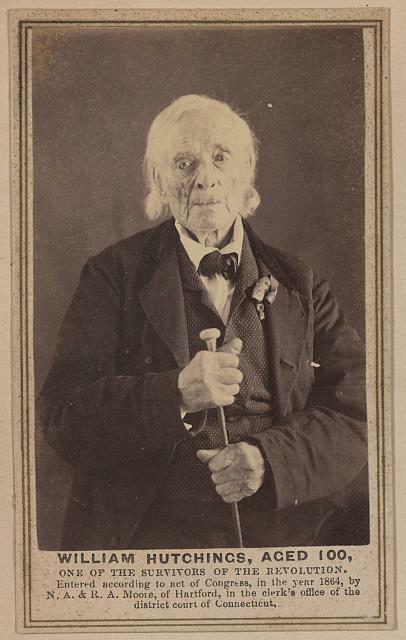 We are accustomed to seeing photographs of veterans—of the recent wars in Afghanistan and Iraq, of Vietnam, of World Wars I and II, of the Spanish-American War, and even of the Civil War—but not of the American Revolution, as the first daguerreotypes were made a half-century after its conclusion. But such images do exist, first compiled in an extraordinary book that I’ve just discovered: E.B. Hillard’s The Last Men of the Revolution (1864). 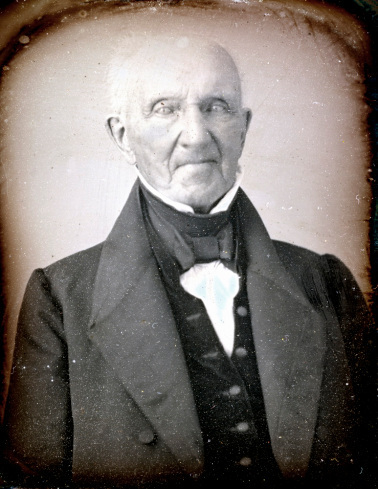 The Connecticut minister clearly had a mission of remembrance in the midst of the Civil War, and he made pilgrimages to the homes of six surviving Revolutionary War veterans, accompanied by Nelson and Roswell Moore, brother photographers from Hartford. I’m sure my Americanist colleagues know of this book, but its existence is a revelation to me: how shocking to gaze upon the images of men who, in Hillard’s words, “looked on Washington…[and] heard his words”. Hillard’s little volume contains eagle-encircled images of the old men in their best dress, along with color plates of their homes and wonderful little vignettes which cover their experiences in the war and in life, along with their views of the “present rebellion”—no confederate sympathies here! There are also prescriptions for longevity: lots of smoking, moderate drinking, “no particular attention to diet”, lifelong physical exertion. You can see the book’s plates here, and below are individual carte-de-visite images from the Library of Congress–beginning with William Hutchings, who was born in my hometown of York, Maine (then Massachusetts, of course) and ending with Newburyport-born Samuel Downing, who harvested fifteen bushels of carrots on the 90-degree day before Hillard came to call. I wish I knew much more about the contemporary reception of Hillard’s book and the Moores’ photographs, but they are certainly inspirational now. 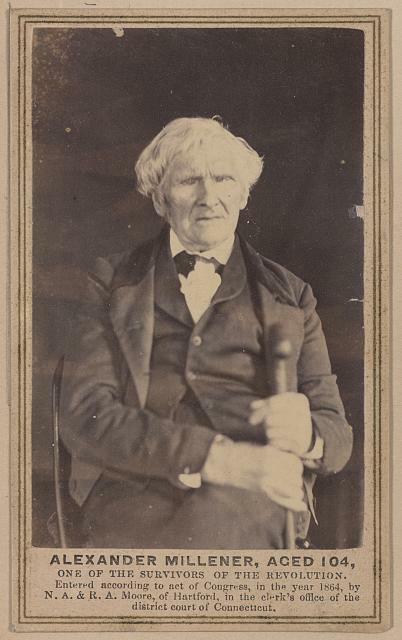 “New” images of Revolutionary War veterans have been uncovered/discovered, most notably by Utah-based journalist and collector Joseph M. Bauman, who recently published his collection in a book entitled Don’t Tread on Me: Photographs and Life Stories of American Revolutionaries (2012) and “daguerreotype detective” Maureen Taylor, who has published two volumes entitled The Last Muster. 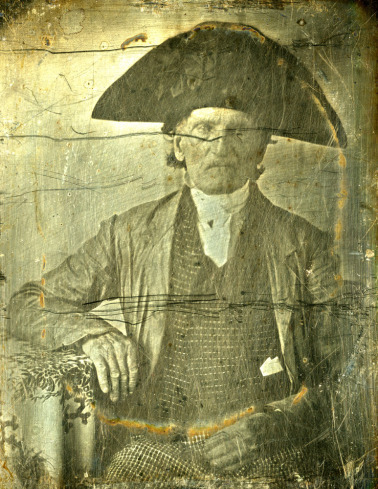 Images of the Revolutionary War Generation. 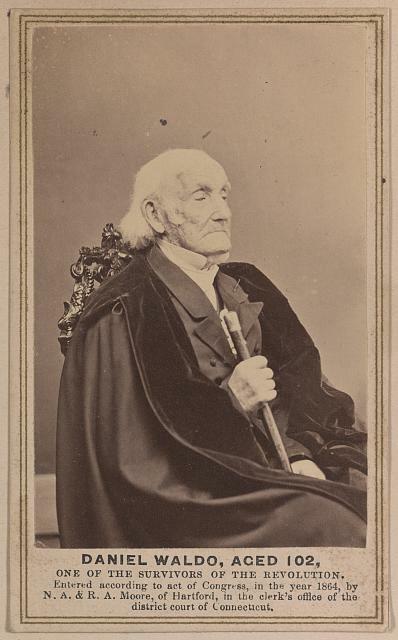 The more interest there is in something, the higher the likelihood of finding more of it, in the case of these rare daguerreotypes, uncatalogued family collections are probably the key source. 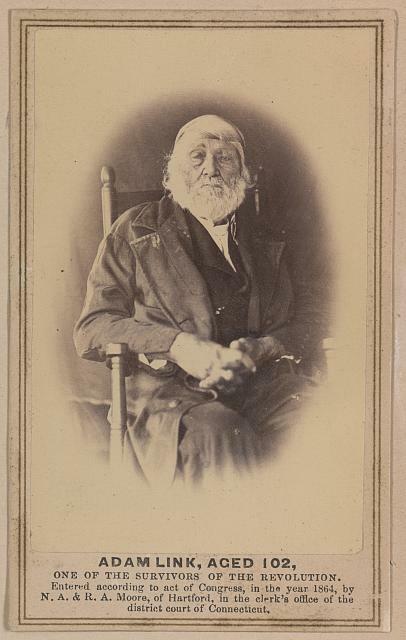 You can see a lovely portfolio of Bauman’s collection here: my favorites among them are another Massachusetts/Mainer, James W. Head, and the flamboyant George Fishley, famous resident of Portsmouth, New Hampshire and “last of the Cocked Hats”. 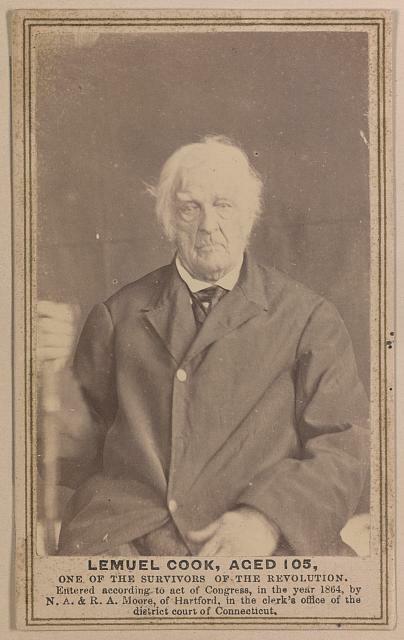 Revolutionary War veterans James W. Head and George Fishley: images courtesy of Joseph Bauman. This entry was posted on Monday, November 11th, 2013 at 6:55 am	and tagged with books, Commemorations, holidays, Photography, Veterans Day and posted in History. You can follow any responses to this entry through the RSS 2.0 feed. It might be possible to find images of veterans from the British forces. It would require a bit of historical detective work though. Most British army regiments maintain archives which might well have records of the soldiers who had fought in particular campaigns (they certainly did not see themselves as an amorphous mass, such as ‘redcoats’). Once a researcher knew who had fought where, they could try and find out if any photos of those veterans were taken for other purposes. It would be a lot of work, though, and it makes my head hurt just thinking about it but I’m sure there’s some PhD student out there looking for a new angle on a well-covered subject. And then are untapped family collections! I LOVE these! It must have been hard to wait until today to share. I’ll have to look for a copy of the book. Hello Steve, nice to hear from you–the house looks GREAT! To me the really sad thing about these images was the reason they were photographed. They were survivors of a time America was at war, taken at a time when it was again. Looking at them, I wonder what they thought of the civil war, after all the loss in the Independence war, only to see the nation tearing itself apart- again. 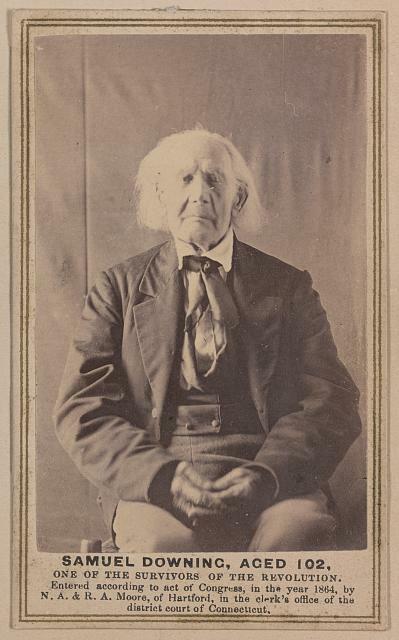 It would be interesting to compare these with photos of the last Civil War veterans. Great website by the way. Well, you’re right–the Civil War was definitely the motivation behind these photographs, and Hillards asks them what they think of the war. As I said in the post, there are no confederate sympathies–it’s a rebellion that should be put down. Wonderful. I had no idea! William Hutchings lived his adult life up here, in the next town over—I was at school with a number of his descendants, now known as Hutchins. His gravestone had long deteriorated, and a few years ago, the DAR erected a new monument. Two great Mainers in this post! I’d have to think that there were likely a Revolutionary War vet or two still alive in the South at the time the above photos were taken, given that there were many more battles fought south of the Mason-Dixon line than north of it. However, it’s not likely that Hillard was able, or perhaps willing, to travel to that part of the county given the ongoing conflict. Fascinating. Thank you for posting that.